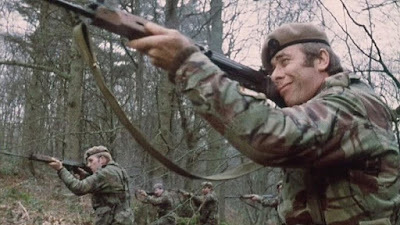 The SLR was in service with much of the British Commonwealth from the mid-1950s and into the 1990s, various small countries still uses it as a combat rifle whilst the Royal Navy and its New Zealand counterpart uses it for line throwing between ships. The British used it for virtually every conflict that fought in during the Cold War, the main exception being Korea which took place before the rifle was introduced into service, and second line British units in the First Gulf War used it. L2A1 "Site Unit, Infantry, Trilux" (SUIT). The Hythe Sight was developed for close range, dusk and night use and incorporated two overlapping rear sight aperture leaves, and a permanently glowing (until radioactively decayed) tritium inserts in the front sight post for improved night visibility. Suggested Rules: Scope that gives +1 to Shooting at Short Range only, also halves Dim and Dark Lighting penalties (round down). The SUIT sight was similar to the earlier Hythe Sight in that it used tritium-powered illumination so that it could be used in low-light conditions. It was not designed as a sniper sight, but it was still issued to designated marksmen. Primary user was the British Army, though it was also used by the Australians and New Zealanders. It was unusual that that it used an inverted sight and thus used allowed very rapid target re-acquisition by leaving a clear sight picture under the inverted pointer when the rifle's barrel was raised by recoil. It was virtually copied by the Soviet Union and designated as the 1P29 telescopic sight. Suggested Rules: Scope (providing the normal +2 to Shooting at Medium range or higher), halves Dim and Dark Lighting conditions (round down), grants an additional +1 to Shooting in the round after the shooter fired an Aimed shot. A 20 round magazine was standard for the SLR, but Commonwealth magazines had a lug brazed onto the front to engage the recess in the receiver compared to the smaller pressed dimple on metric FAL magazines. Metric FAL magazines could be used with the SLR, but Commonwealth magazines can't fit into the metric FN FAL. The SLR could also take the magazine from the 7.62mm L4 Bren LMG, the bigger capacity of 30 rounds came at the cost of the L4 magazines being gravity assisted downwards feeding and thus unreliable with the SLR's upwards feeding system. Suggested Rule: L4 magazine increases the SLR's shots to 30 but imposes the Unreliable rule; when the shooter rolls a one on a Shooting roll (regardless of the Wild Die) it means that the weapon has jammed. Repairs required 2d12 minutes and a Repair roll. The Heavy Barrel was an automatic version of the L1A1 co-developed by Australia and Canada as a light automatic rifle or quasi-squad automatic weapon (SAW), similar to the Browning Automatic Rifle (BAR) or the Bren gun. The L2A1 was an inferior weapon to the Bren as the latter was designed from the start for the fire support role, likewise the Bren's barrel could be changed unlike the L2A1. During the Vietnam War the Australian Special Air Service field modified SLRs and L2A1s by cutting down the barrel length and installing a XM148 40 mm grenade launcher beneath the barrel. Semi-automatic L1A1s were unofficially converted to full-auto capability by using lower receivers from the L2A1. In service with the Australian SAS it was nicknamed after a female dog.